Rec. live, Philharmonie Berlin, 1990 (Orff); Saito Kinen Festival, 2001. This DVD is good value for money � two performances of central European favourite choral works in good sound and vision. If you want this repertoire, I can wholeheartedly recommend this issue with one or two slight reservations. Both of these works are favourites with Seiji Ozawa and throughout both performances his enjoyment is clearly apparent. He has recorded the Orff before, with the same forces (except for the soloists) for DG and also for RCA with the Boston Symphony Orchestra, so he has a long experience of this piece. In the Orff, first on this disc, we have the Berlin Philharmonic at the end of Karajan�s reign, before Claudio Abbado had begun to mould the orchestra into his own ways. We get therefore a highly efficient performance with not too much give and take. In the fast passages, this makes for an extremely exciting journey. However where Orff�s lyricism is apparent the orchestra does not deliver this as they would do at the end of the decade. The Japanese choir copes with the Latin extremely well, and singing without scores, they are able to deliver with tremendous gusto. One vaguely amusing factor is that there is not one example of non-black hair anywhere in evidence unless you include a slight greying at the temples of one or two of the gentlemen. There is not a European in evidence with this chorus. The three soloists are first rate, again all singing without the music, and particular praise must go to Kathleen Battle, singing beautifully with her hands, acting like a second conductor, which is mildly distracting � somewhere where the CD issue is preferable. I haven�t heard the CD issue, which uses different soloists but was recorded at about the same time, and issued on Philips. The RCA performance mentioned at the beginning of this review was recorded in 1969. 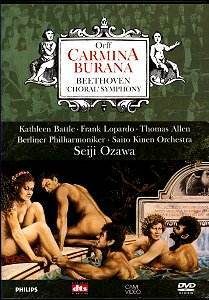 Moving on to the Beethoven Choral we have a different ensemble, choir and soloists, the only common theme being the conductor, Seiji Ozawa. This is the first surprise, since the recording is ten years later, and Ozawa has gone from neatly styled black hair with a hint of grey, to a shock of unruly grey thatch. His conducting style has not changed in the intervening years and his control of his Far Eastern orchestra is just as assured as that over his German colleagues in the previous work. Each year the Saito Kinen Orchestra is reformed from the playing members of a famous summer school. At the end of the school season they tour internationally and also lay down recordings for Philips. Critics have been somewhat sniffy about these performances but I have yet to hear a bad one, even if some works have not been in the absolute top flight. What you can be assured of is that the string section is always highly responsive and extremely sweet toned; so it is here. In addition, the other sections, of very high quality, can be relied upon to be well integrated with their string colleagues. What is more, with the emphasis on chamber playing during the summer school, the players cultivate the habit of listening to their colleagues to ensure a well integrated ensemble. In this performance of Beethoven�s Choral, these qualities are well to the fore, and orchestrally the release is extremely fine. Chorally, similar characteristics are evident with the Tokyo Opera Chorus doing a splendid job for their conductor, again scoreless and just as able with the German as their counterparts in the Orff were with the Latin. Where this performance is let down is with the female soloists, who both have a hard edge to their singing which is not down to balance issues with the recording. I am surprised that a better group could not have been found for such a prestigious event. Notes with this disc are first class, with full texts in Latin and English (Orff) and German and English and notes in English, French and German. Recommended apart from the quality of the lady soloists in the Beethoven.